I am writing to you today on behalf of the Kent County NB Chapter of the Council of Canadians. We are pleased to learn that your government is seriously considering how to undo the considerable damage to human rights enacted through the Anti-Terrorism Act (formerly known as Bill C-51). Unfortunately, we only became aware of your government’s consultation process on this matter about a week ago. In this letter, we ask you to consider the grave social importance of having a public meeting in our area. What follows is the “back story” so that you know why we make this request. Our chapter supporters are some of the Anglo, Acadian, Mi’kmaq, and Newcomer community members who determinedly protected our watersheds, soil, air, communities, properties, and the health of our family and neighbours, from the threat of deep shale unconventional hydraulic fracking in 2013. Actually, we were educating ourselves and others on this issue since 2011, when people in this area first learned about this proposed resource development by SWN Resources Canada. The industry was still in its youth when we heard it was coming here. Still, we were not operating on a lucky hunch when we began to kick up a fuss about the proposal for this to happen in our neighbourhood of New Brunswick. We were warned of the serious issues by other communities in the United States, who had been in the first wave of those to be fracked. For that, we are extremely grateful..
Aside from documented cases of pollution of water, soil and air, this resource extraction process is incredibly capital and water-usage intensive, It contributes terribly to global climate issues due to fugitive methane releases, flaring, and the carbon footprint of the industrial practices of drilling, transporting, etc. On top of that, this form of deep fracking has proven to have very low productivity after just the first year. When the wells become too unproductive to merit more fracks, they are no longer used. Most governments have not demanded a guarantee for close-down in the contracts with proponents. Sometimes wells get capped off properly, but these may remain hazardous unless monitored continuously. There are many time-bombs in aging frack plays, because the cost of proper decommissioning and monitoring is greater than the profit margin supports. Subsequent to our success at stopping the proponent from commencing with drilling, we have been proven correct in our concerns. There is now conclusive scientific research on the risks and hazards of this form of fracking. Our concerns were acknowledged by the Government of New Brunswick earlier this year, when an indefinite moratorium on hydraulic fracking was announced. In short, we have been exonerated: we were right to defend our families and our rural environment from this environmental threat. Yet, in 2016, there are road-level resistors/protectors who are still living with court “conditions.” The conditions imposed on many of our Indigenous allies are far more severe than what a non-Indigenous person would expect. All-out attempts were made to make an example of us and thus discourage other similar Water Protection actions across Canada. The facts about fracking above illustrate that we did the right thing when it needed to be done. We did this despite having to face down our own provincial government, one of the largest oil and gas mining companies in North America, and the most powerful resource extraction corporation in this province who also controls the vast majority of the mainstream media. In a sense, we were on the side of the angels, but obviously some of the national security forces in Canada did not agree. Around the same time as Bill C-51 was introduced to the federal parliament, a “top secret” RCMP 2014 document was somehow obtained by Greenpeace and released to the media. This document is an internal “security force” backgrounder. It clearly makes the argument for a stronger legislative framework to criminalize grassroots environmental protection action. It is significant to note that this document repeatedly suggests that peaceful protesters who assemble over climate concerns or other environmental issues are somehow a risk to national security. It is a disgrace that such a document would be produced in a country committed to respect for the civil and political rights of its citizenry. Throughout the document you will note that our allies and ourselves are specifically portrayed in a very negative manner. Completely missing from this biased document is what we actually did for four years to protect the water and environment here in Kent County NB and why we did it. Also, the document suggests we were all dangerous and inclined towards violent protest. Exaggerations, lies, misinformation, and disinformation are propagated in this official document. This is only one example of how we Protectors and Defenders have been villainized, disrupted, and otherwise attacked in the so-called interest of national security. We do not expect an apology for these slanderous comments. We would like the opportunity to tell leaders of Canada about the damage your police and security forces have done to lives here with these and other attacks. Two civil court actions were filed by SWN Resources Canada in Fall 2013 against some of us and our allies. (A link to an article on the first suit is provided in this section’s heading.) It is evident that these claims were launched for the purpose of discouraging public involvement in resisting the destruction of our local environment. Typically, civil actions like these are known as “SLAPP suits” (Strategic Legal Action to Prevent Public Participation in social activism). They include a claim for damages, on the basis of which an injunction is sought against protestors. In many jurisdictions there is no legislation preventing corporations from launching these exasperating actions. As in our area, the names of all accused would be dragged through the mud in public while all these people are doing is exercising their civil and political rights. An increasing number of jurisdictions are bringing in legislation that prevents frivolous and noxious legal action like this. To protect the rights of all Canadians, federal initiative is needed to ensure that SLAPP suits cannot happen anywhere in this nation. In 2013, we spent seven months on the roads of this county to stop SWN Resource Canada’s search for the best fracking drill sites. Many of us – especially our Mi’kmaq allies – were subjected to severe repression by the RCMP. Numerous abuses of power took place. The RCMP also completely and inexplicably flip-flopped on the question of whether it was their responsibility to enforce a private corporation’s civil suit seeking damages for their losses from community leaders. Initially the RCMP said it was not their job: there is a court affidavit dated October 9th that substantiates this. For some unknown reason, a week later they changed their opinion, and immediately initiated one of the largest police attacks on a public protest ever seen in Canada. Even this assault, and a myriad of trumped-up charges and release conditions, did not stop us. Resistance continued on the road for another almost two months. Many of us who were involved feel strongly that much of the non-peaceful conduct on 2013 was the work of outsiders, possibly provocateurs, conceivably working for a security force that wanted to make us look bad. Not coincidentally, no protector/protester was convicted of the most controversial activity that took place: the burning of police cars. Our feelings about this are based in reality. It has been previously determined that RCMP have burnt buildings and cars, and conducted other illegal activities to discredit dissenters and activists. Many of us were traumatized by the experiences we had at the hands of the RCMP. Arising from all of this, hundreds of complaints about police abuse of powers were documented. These are being investigated by the Civilian Review and Complaints Commission for the RCMP. In December 2014, we were relieved to learn that the Civilian Commission has taken this matter so seriously that their own Commissioner also filed a complaint regarding RCMP activity. It is now more than three years since these abuses took place, and more than two years since the investigation began. It is very demoralizing that there has been no news about when we can expect a report from the Commission. Sadly, being disappointed by the Commission is not a huge surprise. In 2009, the Harper government removed outspoken Paul Kennedy, head of the Commission for Public Complaints against the RCMP, from his position. The government at that time also cut the budget of the this agency, and narrowed its purview. Subsequently, in December 2014, the Harper government finished off any hope for a valid independent process for review of RCMP actions through passage of the Enhancing Royal Canadian Mounted Police Accountability Act. This closed the Commission for Public Complaints and replaced it with the current Civilian Review and Complaints Commission for the Royal Canadian Mounted Police (CRCC), which is mandated under the RCMP Act and has no powers to order anything. The CRCC can only make suggestions and use moral suasion. That is exactly our point. When any of us are handled like enemies of the state, when civil and political human rights are violated by the state, all of us are injured. Then we are all affected and become extremely distrustful. That is the situation today in Kent County NB. There are no comparable information releases for non-Indigenous people involved in environmental protection or social justice action across Canada, or specifically here in NB. However, we can be sure there is a long general and a shorter “watch-list” for non-Indigenous persons as well. At the community level, we grassroots people are all in this together. As well some non-Indigenous people have been long involved in peace and justice civil disobedience, and many work together with Indigenous communities. In this submission, we have not touched on all the problems in Canada’s current national security legislation, policies and programs. As mentioned, only last week we accidentally learned of this consultation process deadline. There are certainly dozens of issues we would like to highlight, but shortness of time makes that impossible. For now, suffice it to say we endorse anything sent in by any chapter of the Council of Canadians, the national office of the Council of Canadians, or from KAIROS, Voices-Voix, or the Canadian Section of Amnesty International. Our immediate request is that your Committee come to Kent County NB to hear from people directly how we feel about being made to look like enemies of the state. Speaking for our Chapter members, and advocating also for all our diverse Water Protection allies, you need to see our faces and hear our voices to understand what needs to change and why. After the treatment many of us endured, we need to know you care enough to take the time to do this. It may be a first step to rebuilding trust. As former NWT Premier Kawfki says, we are all in this together. There is no Planet B. We need to figure out how to get along and pull this planet back from the brink of ecoapocalypse. We are in a real mess. On Saturday October 31st, at the KAIROS forum on fracking and human rights issues, I happened to meet Commissioner Cheryl Robertson, who was in attendance for that portion of the forum. Ms. Robertson confirmed for me that the Commission is not yet informed on the two matters I address in this submission, which relate to the first and fourth points in the Commission’s mandate. The material in this section is extracted from a memo submitted by our Chapter to the Civilian Review and Complaints Commission for the RCMP, who are investigating RCMP conduct during the 2013 anti-fracking protests here in Kent County. The serious nature of many underlying issues and complaints about RCMP conduct is underscored by the fact that, midway into this investigation, the Commissioner for this civilian oversight body filed his own complaint with the RCMP. This text below was forwarded to the Civilian Commission on September 25, 2015, from our Kent County NB Chapter of the Council of Canadians. It was written to respond to a specific request for submissions from the Civilian Commission – on a matter not directly relevant to your Commission on Hydraulic Fracking. For your convenience, the text below has been slightly edited. Should you wish to refer to the original version for context, this is the link. Here, then, is an account of some of the civil and political human rights violations experienced during the anti-fracking protests in 2013. It is very clear to us that we became targets of a public relations war. From 2010 on, the Government of New Brunswick was determined to shove deep shale gas industrial development down the throats of rural New Brunswickers. This meant we had to accept the new style of hydraulic refracturing – called “fracking” – which is clearly dangerous. Communities across the province were in an uproar over this. There was and is no evidence that there are any real benefits to the communities that get fracked, but initially the provincial government used simple bluster and positive assertion to try to convince the public about the economic benefits and safety of deep shale gas fracking. As the truth started to come out, especially in peer-acclaimed research on benefits, risk, and hazards found in the New Brunswick Chief Medical Officer of Health’s Recommendations Concerning Shale Gas Development in New Brunswick (September, 2012), it became evident that the government was losing its public relations war. By 2013, it became patently obvious that corporate and public officials (both federal and provincial) were concerned only with promoting climate-killing “extreme” petrochemical industrial development. The pro-fracking elite was desperate. They needed a new public relations strategy, and decided to demonize those of us who wish to protect the environment and community health from fracking. Their public relations war was tweaked a few times, and ultimately re-aimed to focus on the danger of indigenous people and their environmentalist allies. 1. It is apparent that the RCMP have not been educated on the common knowledge about the Peace & Friendship Treaties, in which there was no surrender of land or resources by the Mi’kmaq People. It was evident as well that the RCMP have not benefited from cultural competency or anti-oppression training. 2. The issues at stake were basically a civil matter, where a corporation wanted to do something in and around communities that opposed this activity. People have a right to non-violent protest against such activity, a right that is guaranteed under the Canadian Constitution as well as the various international human rights accords to which the Government of Canada is signatory. The people involved in protest and protection resistance were well aware of their rights. This is why there were so many elders, women and children involved in the actions. No one expected the things that happened. 3. The “Crown” failed in its obligations under Section 35 of the Canadian Constitution and additional legal precepts established by the Supreme Court of Canada and international law. The “Crown” in this case is the Province of New Brunswick, because management of natural resources falls under provincial jurisdiction. 4. The underlying purpose of all this activism was first and foremost to protect the water. This is a poor region where there are few actual jobs. Most people of all cultures here make their livelihood at least in part from the land, rivers, ocean, and forests. Water is essential for the survival of people and these natural resource areas. People were concerned that the loss of good fresh water would mean having to leave the area where their family and cultures have lived for many generations, and in the case of the Mi’kmaq People since time immemorial. There appeared to be no understanding by the RCMP that protection of the water was the underlying issue for all community members involved in resisting the corporation’s activities, and a core issue for the extended communities supporting these activists. 5. The Government of New Brunswick contracts the RCMP as the NB provincial police force. Because the force is first and foremost a federal one, Indigenous people in particular have established expectations and protocols regarding the RCMP. To a certain extent, so do all Canadians. To enforce its pro-fracking policy, the New Brunswick provincial government exerted extreme influence and pressure on the RCMP to “break” the non-violent resistance of Kent County environmental protectors and protestors. This alone was the major factor creating the alienation between community members and the force. 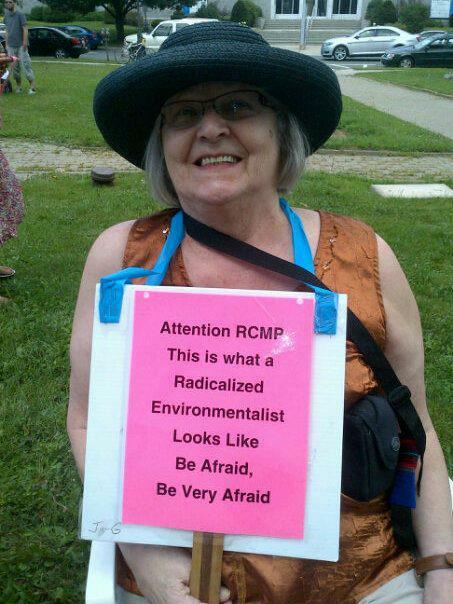 We knew that the RCMP were being used politically to advance a corporate/government agenda we opposed. None of the authorities cared to consider the relationship damage they were creating. With this mandate, the RCMP operated as a military-style force to implement the government policy that shale gas development would go ahead despite community uproar across the province. The criminalization of protestors and protectors was a choice made by RCMP commanders who instructed the forces on the line. 6. During the initial days of the corporation’s activity in Kent County (June 3 – June 20 2013), the RCMP appeared to be equally concerned with criminalizing both non-Indigenous and Indigenous activists, as they faced non-violent resistance from a united front of Acadians, Anglophones, Mi’kmaq, and other allies. However, by June 21, which is ironically National Aboriginal Day, the focus of the RCMP switched to total concern with Indigenous activists. The Civilian Commission for RCMP complaints heard from various individuals (both non-Indigenous and Indigenous) about this biased conduct, related to June 21st and the following weeks and months. 7. Ours is a tightly networked rural area where most people know or are related to each other in some way, across all three founding cultural communities. 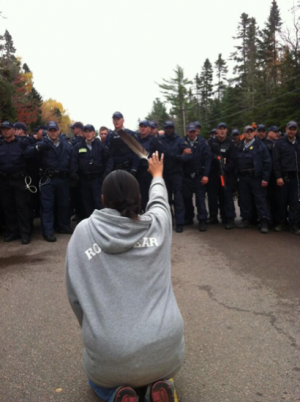 Many of the protestors and protectors also have extended family members employed in the RCMP. Informally through community networks, it is our impression that many officers with local Kent County RCMP detachments were not in agreement with the way that the force was commanded to operate during these months. The voices and reasons of these local peace officers, as to why they disagreed, should have been heard and considered fully. That is the way good community policing is done. 8. The events of October 17 2013 were the most obvious breach of people’s constitutional rights. Looking at an affidavit by Mark Lenehan, prepared by legal representatives for SWN Resources Canada on October 9 2013 (this has already been submitted to the Commission), we see quotes from an RCMP operational commander at the protest site. Sgt. Robichaud tells Mr. Lenehan that going into the 134 camp with Lenehan to serve papers re: the civil action injunction would amount to “inciting a riot” and “igniting a powder keg.” Ann Pohl is one of the people specifically named in the injunction related to this affidavit. Prior to October 13 2013, when Ann visited the camp, she was assured by RCMP on duty at the police blockades (located at either end of the protest area) that she could enter the area without risking arrest. Specifically, she was told it was not the RCMP’s job to enforce a civil action injunction. Despite all the apparent tolerance and understanding by RCMP on duty during the weeks leading up to the October 17 commando raid on the protest site, we all saw what happened that day. On October 17, the RCMP’s callous disregard for human rights and safety of people was a stark contrast to their easy-going attitude in the weeks before. This deeply hardened community attitudes against the force. ♦ A sacred gift of Tobacco was provided by the RCMP to some of the Mi’kmaq protectors the night before the raid. Everything that happened after was a complete violation of the significance and protocols associated with this gifting. ♦ As it was being launched, all Kent County roads leading to the site were closed EXCEPT the roads that go from Elsipogtog First Nation. To many people, this suggests that the RCMP were actually baiting First Nations people to come into the fracas that the RCMP troops were creating at the site, so that it would appear to the media and the outside world that the only people involved in the protest were Indigenous. ♦ Two very different stories were used to explain the rationale for the police assault. Early that morning, the RCMP brought in trucks equipped with powerful public address systems. These were used to proclaim the civil law injunction as a pretext for the invasion. Yet, hours later, the RCMP commented they had to invade the protest camp because they had “intelligence” about a build-up of weapons on site, and feared things were going to turn very dangerous. As there was almost no verifiable evidence of a weapons buildup, both excuses contradict what RCMP said a week earlier (see Lenehan affidavit). 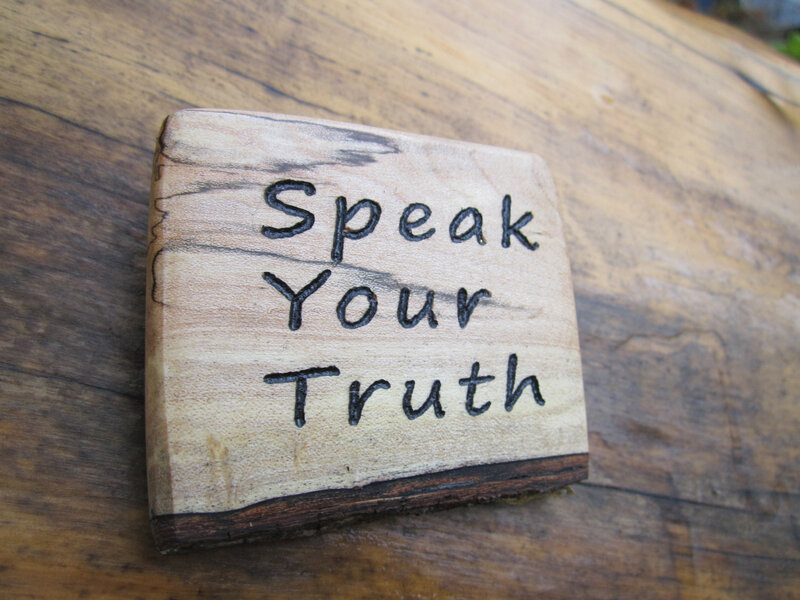 Dishonesty undermines public faith in the trustworthiness and credibility of our public servants. ♦ The burning of the police cars was major news across the country. We are all convinced that it was not done by anyone who was part of our united movement to protect the environment. Among all Kent County protestors and protectors, and our allies, there is a wide-spread belief that agents working for some arm of the RCMP or a sister federal force are responsible for the burning of the police cars. Your Commission is well aware of this view, from complaints and comments you have heard: unusual RCMP activity immediately before the fires appeared; querying what accelerant could actually cause the fires to start so quickly; failure by RCMP to protect the crime scene of the burned cars; why the cars appeared to be lacking standard police communications equipment; the possibility that the cars were deliberately decommissioned at a specialty shop the week previous; the cars were left at the road for so long after the burning; knowledge that such provocative acts have been done before by the RCMP (eg, at the G-20 protests, etc. ); and many more points. The evidence points to this conclusion: the RCMP burned their own cars, or hired someone to do so, in order to affect public opinion. This is a kick in the teeth to the entire community, making those of us involved in non-violent resistance to protect our environment for future generations look like hoodlums. ♦ Many people continue to face charges and other legal and financial consequences as a result of this RCMP action. For some, this has been devastating. Some people pleaded guilty as they had no financial means to defend their rights through the justice system. We are now, in fact, more united than ever in our collective determination to protect this territory we share in “Peace and Friendship.” Some of the community members being interviewed by the Civilian Commission‘s investigators were led into a field of inquiry about divisions between activists based on cultural heritage. We sincerely hope that these questions do not reflect biased attitudes by Civilian Commission personnel. We hope these questions were asked only to determine the relative validity of information provided by the RCMP to the investigators and staff of the Civilian Commission. But, we have learned not to trust. That said, we have clearly stated above that we note that Indigenous protestors and protectors were handled in a much rougher and meaner manner by RCMP than non-Indigenous ones. Most of the issues that arose over this period in regards to the Indigenous protectors and protestors are addressed in the final Report of the Ipperwash Inquiry, submitted by The Honourable Sidney B. Linden (Inquiry Commissioner) on May 30, 2007 to the Government of Ontario. Echoing specific points highlighted in that report, it was clear from the conduct of RCMP officers here in Kent County that the members of the force were never briefed on why people were engaged in these protests, occupations, and actions of non-violent civil resistance. RCMP were also not made aware of the significance of the “colour of right” (another point highlighted in the Ipperwash Inquiry report), in regards to the sincere motivations of all protestors and protectors. People engaged in actions were making a good faith assertion of their right (even obligation) to defend their water, land, air, communities, and family health, because the threat being posed to these things would result in their irretrievable loss. It is the fault of the provincial government that Kent County neighbours and allies felt this desperate, but the RCMP needs to be a peace force for all the people, not for the government. The most important fact for your NB Commission on Hydraulic Fracking to retain from this entire excerpt above is that we have learned the hard way not to trust anything GNB says on this topic. We know that the RCMP work for the Government of New Brunswick, as do you, as did the discredited Louis LaPierre, and as do many civil servants who have participated in the ongoing attempt to force us to accept something that we have rejected. Through all the above (and much more not in that brief summary), we the Peoples of Kent County stand united in our non-violent, unbending determination to protect our homes, our communities, the health of our families and neighbours, our water, our air, our soil, and the rest of the natural environment that sustains us all. We do so at great cost and sacrifice for many of us, because we want all our grandchildren to have a future here. We believe that GNB should abandon its retrograde love affair with the very substances that are killing our planet, which have brought our global climate to the precipice of ecological apocalypse. GNB should stop spending our money on deals for petroleum and other related industries, and commissions such as this one (etc.). GNB should massively invest in upscaling of renewable energy research, development and innovation. This is the most basic and fundamental requirement of any evaluation about whether or not deep shale gas extraction can be permitted in this region. The previous sentence is all the more true because there is no mention of surrender of resources or land in Mi’kma’ki under the Peace & Friendship Treaties, which are the legally binding agreement documents governing title and shared use of the land in the province of New Brunswick. In short, the Government of New Brunswick holds no true title to the land it has leased to shale gas extraction companies, and it has never consulted properly with First Nation communities on the issuance or terms of these leases. Please do not follow the proponent’s (SWN’s) suggestion that the 2011 GNB Duty to Consult Policy sets out a reasonable path, which simply needs better implementation. That policy is wholly inadequate. Section 35 of the Canadian Constitution specifies the obligations of the Crown to Aboriginal Peoples, and on matters of natural resources the “Crown” is the provincial government. These obligations mean that valid consultation processes are an essential precursor to any infringement on Aboriginal treaty, original, or unceded, territories. In regards to First Nations in specific, this is well-established law in Canada. Several important Supreme Court of Canada (SCC) cases uphold and augment the law on this section of the Constitution. To address this fourth point of the five conditions that are to be met to lift the moratorium, any process your Commission conducts, or recommendations you develop, will not be adequate. The Government of New Brunswick must understand and implement a “Free, Prior and Informed Consent” (FPIC) process for consultation with the Indigenous Peoples of this region. The first place you need to go to understand this, and what is meant by “FPIC,” is the United Nations Declaration on the Rights of Indigenous Peoples (UNDRIP). The Government of Canada is signatory to this Declaration, but under former Prime Minister Harper’s regime this was a long time coming. It only happened because Canada was shamed into it both domestically and internationally. The Harper government was ideologically opposed to recognizing Indigenous Peoples’ human rights. It actively promoted Canadian public acceptance of this corporate-based goal, leading to the totally militarized relationship that currently exists between the governments of Canada, and indigenous earth protectors and their environmentalist allies. Through policy, act, law, and covert means, the Harper government enlisted the active support of the RCMP and other state security forces to promote their agenda of repression and oppression. This government did so despite judicial reprimands from the Supreme Court of Canada and massive civil society protests. When the Harper government finally signed the Declaration, it raised specific objections to the text. To proceed, as New Brunswick seems to be doing, to ignore the huge “elephant in the room” – the issue of Indigenous Rights – is mind-boggling idiocy. This approach is so far out of line with the reality of 2015, one can only wonder: in what century is GNB stuck? New Brunswick has had its head in the sand for far too long, in far too many ways. There is no point continuing in this vein. To reiterate, reading UNDRIP in tandem with the Treaties, the Canadian Constitution, and relevant SCC decisions, makes it clear that your Commission cannot undertake FPIC. FPIC is the responsibility of the Crown under domestic and international law, and cannot be undertaken by a commission of inquiry such as yours, which has no mandated power to dialogue or negotiate directly on behalf of the Crown. report back to GNB as soon as possible that it will be impossible for your Commission to report on that portion of your mandate, while taking care to include in this “report-back” what you have learned during your inquiries into points 1 and 2 immediately above. In regards to the matter of consultation with Indigenous Peoples, this would be the only option for accountable, transparent, and responsible action on your part. …Was the RCMP Report “leaked” to Justify Bill C-51? A top-secret RCMP report was “leaked” to La Presse in between the smooth First Reading of the Harper CON’s Bill C-51 – aka the “Security of Canada Information Sharing Act” – and the Bill’s Second Reading. This report portrays Canadian and Indigenous environmentalists as violent crazies who threaten Canada’s “economic interests“ and could be physically dangerous to the assets of petroleum industry assets as well as first responders, etc. The RCMP Report was more than a year old when it became public. The timing of this “leak” synchronized precisely with the debate over Bill C-51. Most people assume it was leaked by someone sympathetic to environmental activists — or someone concerned about the way Bill C-51 could undermine human rights across Canada — or perhaps both. The Harper CON government relies on disinformation, dirty tricks, and misinformation to ram through its political agenda. This nasty, lying and ignorant report just happened to emerge into the light of day at a crucial time and its release has certainly fed the flames of alarm on all sides of the debate around Bill C-51. It all smells bad to me. I regretfully imagine that it could perhaps have been strategically “leaked” — i.e., “planted.” The Harper CONs must want to reassure the Big Oil/Gas/Mining Corporations who bulk up their election funds that the RCMP will soon have tough laws to get rid of those pesky environmentalists. The RCMP’s no-doubt high priced security analysts seem ridiculously unaware of the urgent necessity to do something to limit CO2 emission and try to save all life as we know it on this planet. The “leaked” report makes patently clear that the RCMP is in complete denial about climate change trends and impacts. The ignorance of the RCMP about the biggest social issue facing humanity at this time — skyrocketing climate change impacts — is especially frightening. The RCMP’s institutionally sanctioned denialism calls into question how much time is being spent training our national police force for effective response to increasing climate change-based natural emergencies. Yes, I am scared by this and not much scares me. Whether leaked or planted, and whether by friend or foe, the RCMP report totally maligns us. It mocks and shreds the motivations, intentions, and conduct of our diverse, global, climate protection grassroots movement. Its deceitful content appears designed to undermine public confidence in our integrity and values. The report makes us look like we have actually been found guilty of things that have never been proven. Right on page 1, those famous burning police cars are trotted out as evidence that my allies and I are – quite simply – thugs. • “resistance” to protect our communities, families, health and environment..
Over time and under serious provocation, tempers got frayed, but still there was no violence until the RCMP launched their militarized invasion to free SWN equipment on October 17, 2015. The secret “leaked” report says those burning police cars demonstrate how dangerous we are. I say there is no proof whatsoever that we torched those cars. Following are a dozen points that suggest a very different scenario regarding who burned the police cars. I am named as a defendant in the SWN Resources Canada lawsuit launched on October 3, 2013, which was specifically designed to prevent my participation in protests. This type of lawsuit (SLAPP) is specially and frequently used against non-violent environmental protectors who would not be liable for any criminal charges. I mention this because I have to bring to your attention “Tab 11” in the 4” binder with which I was eventually personally served by Atlantic Document Services (ADS) on behalf of SWN. In that affidavit, an employee of ADS explains that as of October 10, he was unable to gain access to the Unity Camp to serve notice of this lawsuit to named parties. The ADS employee swears under oath that RCMP Sgt Robichaud told him if they entered the encampment and “attempted and/or served the document, we would be inciting a riot…,” and while “they [RCMP] would not stop us from going into the site, they could not guarantee our safety and we would be on our own. The RCMP would not accompany us. They did say we would be igniting a powder keg if we attempted service” (bolded words are my emphasis). Many people have speculated on why the RCMP decided to swerve from the position articulated to this ADS employee (above, point #1). Why did the RCMP decide to risk “igniting a powder keg” and attack the Unity Camp to serve the injunction accompanying this lawsuit? The most prominent theory is that the corporate/political powers had lost patience with the hands-off attitude of the RCMP, and were putting on the pressure to take action against us. On October 18th, the Court of Queen’s Bench was going to hear arguments for and against extension of the injunction against protesting at that location, which was based on that lawsuit. Many of us were preparing to go down and speak against the injunction as a violation of our civil, political and other human rights. SWN and the government may have put on a lot of pressure on the RCMP to end the encampment before the injunction was overturned. A lot of work had to be done to manufacture an excuse for the RCMP to change its frequently reiterated position of non-intervention in this civil litigation matter, which the RCMP said was not their business and was simply between a corporation and private citizens. In the two or three days just before the October 17th police riot, there was a lot of provocative-style destabilization at the Unity Camp. Some of what Unity Camp protectors witnessed or experienced is covered in this article Prelude to a Raid. It is written by Miles Howe, an environmental activist and a journalist who was on the front line throughout the entire period. As you continue reading through this list it is important to remember that all the Warriors and many other dedicated activists had already been arrested and removed from the scene, or dispersed, when the cars were set on fire. Who was left on the site at the time? For the most part, after the mass arrests, tear-gassing and less lethal ammo rounds fired by police, the people witnessing were residents from the surrounding area who went down after the predawn raid commenced. These witnesses were kept out of the primary protest area by police. There were also perhaps some curiosity seekers and maybe some “outside” troublemakers. Despite so many officers at the site, the police left these cars completely unattended. In fact, although there was no threat to them at that time, they all ran down the road, got in other vehicles, and drove straight away from their own squad cars. The cars went up in flames almost instantly, in what seemed a totally choreographed motion, and they burned a very long time. This all suggests very organized and professional arson involving an exceptionally effective accellerant. Looked at in isolation, without comment on the strategy, these actions and resources seemed to me to be technically way beyond the capacity of our remaining ragtag collection of non-violent environmental protectors. After the flames died down, witnesses and neighbours who looked at the torched police cars saw no evidence of computers or radios inside. It appeared that these had been removed before the cars may have been deliberately parked where they were, with the plan that they would soon be torched. I heard this from numerous people, including two people who told me they personally saw empty places where communications equipment is located in police cars. At the point they saw this, the cars were still smoldering and too hot to be touched, so no one had removed them post-combustion. Word of the cars having been previously prepared for decommissioning spread during the weeks after the police riot. I cannot find the material I saw online about this, but I clearly remember reports that a week or more previous to the police riot, these particular cars were all serviced at a shop in an eastern New Brunswick that has previously done specialty work for the RCMP. The witnessing of events by former military policeman Allan Marsh, a local resident and community politician who opposes fracking, both reiterates and supports some of my points about the person who lit these cars on fire not being one of us. Allan spoke to As It Happens about this the day after the police riot. The burned cars were left on the road for several days. No yellow crime scene tape was put up. If any evidence such as fingerprints, footprints, samples of the accelerant used, or anything else was gathered by the RCMP, it was done in complete secret. No one told me they saw the RCMP step in to gather evidence at this crime scene in a timely manner. Someone who is 100% reliable and a committed non-violent environmentalist was emotionally devastated that the burnt cars were being blamed on us. Two days later, he went to the local RCMP detachment to ask whether the burning of the cars was being investigated. He was met by a frozen silence, followed by a terse statement that they were investigating. Then he was told that the results of the RCMP investigation into this would not be made public. When this person’s questions continued, he was told to leave. To recap, there was no protection of the crime scene, which suggests that the RCMP did not want to gather evidence on who burned them. Someone I know who is also a determined, peaceful and mature anti-fracking activist and environmentalist, was appalled by the mere thought that someone might think we burned the cars. She told the RCMP she had quite a good look at the person who set the cars on fire, and did not recognize him as one of “us,” but knew what he looked like. The action angered her so much, his image was burned in her memory. She offered to look at any photos the RCMP had, to try to identify the person in question. She waited many months for the RCMP to come back with photos, during which time her offer was not taken up. Much noise is still being made by apparently pro-climate change politicians and security forces that the burning of these cars is our work and demonstrates how dangerous my allies and I are. No charges were ever laid against the arsonists who lit these cars on fire. In general, in regards to the events of October 17th, so much public effort and resources went into getting a few convictions on public mischief and dangerous handling of weapons, etc. If it had actually been possible to argue that some of us burnt those cars, certainly charges would have been laid. my concerns this denialism is a strong indicator that Canada’s security forces are hugely unprepared to assist the most vulnerable part of the general public (those of us in rural and low income regions and in Indigenous communities) from the unfolding onslaught of climate change-based natural disasters. The Commission has a legislated mandate to recommend education, training and policy changes to RCMP management, in order that the RCMP might improve how they protect and serve the public. Our own police force, that we pay for with our tax money, and on whom we must rely in emergency situations, should not be involved in activities that are designed to discredit and criminalize people like us. 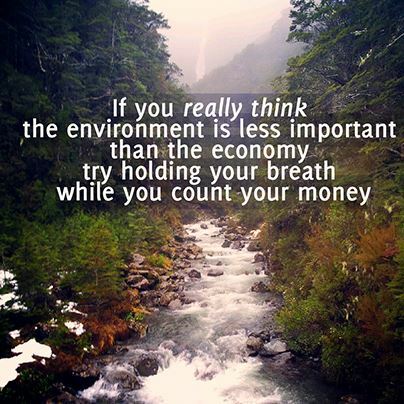 We are simply trying to protect what remains of the natural environment that sustains all life on our planet. Above and beyond all other considerations, we must protect our right to be vocal and active in human society on these matters. I have a special interest in this, but so do we all.